Just try to resist the charms of Mira Nair’s “Queen of Katwe,” a triumph-of-the-human-spirit movie that’s ultimately, well, triumphant. The story — a true one, as you’ll be reminded in the delightful end credits — is one of those irresistible underdog tales: Phiona (Madina Nalwanga), a young girl growing up in poverty in the slums of Katwe, Uganda, learns unexpectedly that she has a knack for chess. With the help of a kind mentor, Robert (David Oyelowo), and the support — if not always the understanding — of her fiercely loving widowed mother Harriet (Lupita Nyong’o), Phiona works hard to achieve her dream of becoming a chess champion. You’ve likely seen a hundred movies with a similar arc (seems like I’ve seen a hundred of them already this year), but there’s a reason: when it works, it works. “Queen of Katwe,” for all its familiarity, is a family film in the best sense of the phrase. It’s suitable for all ages (though its two-hour running time may be a challenge for young squirmers), and it celebrates the bonds of family: both the one we are born into, and the one that we acquire. There are no villains in this sweet tale, just a few temporary missteps. Harriet at first mistrusts the sports ministry run by Robert where Phiona is encouraged to develop her chess skills; a woman accustomed to hardship (she sells vegetables in the street to pay for her family’s meager dwelling), she doesn’t see the point of a game. Nyong’o plays Harriet as both tower of strength and woman wrapped in a smothering shawl of pride that she rarely allows to drop. Watch her fiery exchange with Robert, as he suggests Phiona might attend a prestigious school: “I am not an educated woman. I understand nothing,” she tells him, in words so dripping with venom you wonder how he’s still standing. 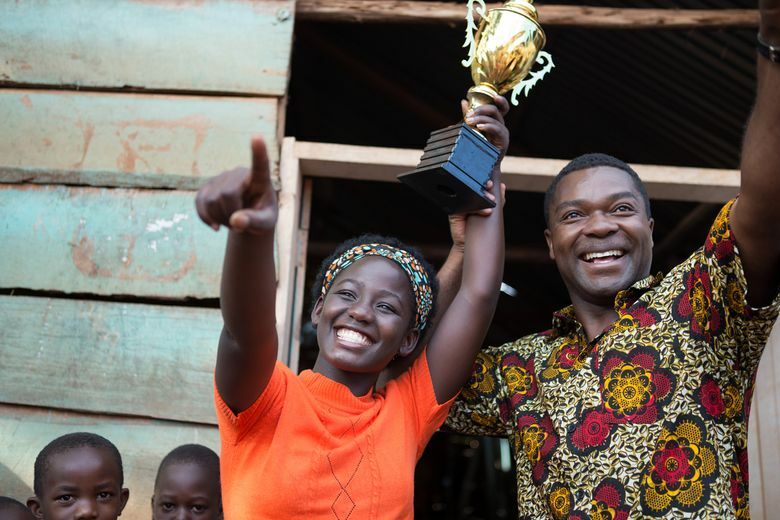 ‘Queen of Katwe,’ with Madina Nalwanga, David Oyelowo, Lupita Nyong’o, Martin Kabanza, Taryn “Kay” Kyaze, Esther Tebandeke. Directed by Mira Nair, from a screenplay by William Wheeler. 124 minutes. Rated PG for thematic elements, an accident scene and some suggestive material. Several theaters. Things grow dark for Phiona and her family (which also includes two young brothers and a cautionary-tale older sister) before light dawns: In one haunting scene, evicted from their home, they stumble through the dark streets carrying their possessions. But we all know how movies like this are supposed to end, and “Queen of Katwe” doesn’t disappoint. As a metaphor for life, we learn, chess is invaluable — you may leave the film hearing Robert’s sage advice echoing in your head. Find safe squares. Don’t be quick to tip your king. And, most important: What matters isn’t losing, but finding the strength to reset your pieces and start again.